Because that’s all you need. 1 cup yellow cake mix + 1 cup confectioners’ sugar in microwave safe bowl (yeah, that means this stuff is not going near a pot or the oven. Add 1/2 stick (1/4 cup butter) and 1/4 cup milk. Don’t mix. I cut up my stick of butter because I decided I could afford the extra 10 seconds of effort. If you can’t, no sweat. Cut another corner. Enjoy. Place in microwave for 2 minutes. Take it out and stir immediately. Now it looks like cake batter. But sweet. And delicious. Mix in sprinkles and pour into a greased pan or, as I did, a plastic container. Classy. Oh, and did I mention that you could do this WITHOUT DAIRY? This time use margarine and soy milk. Halve the soy milk (1/4 cup margarine, 1/8 cup soy milk). Yum. Can we look at that again? Refrigerate for 1 hour, then cut into squares. Congratulations. You have just made cake batter fudge. All the goodness of sweet fudge without the candy thermometers. No equipment. No mess. 1 bowl. And this one I licked clean. Recipe adapted from girl meets life. Mix cake mix and icing sugar in microwave-safe bowl. Add butter and milk. Don’t stir. Microwave for 2 minutes. Stir immediately until completely combined. Add sprinkles. Do not overmix as sprinkle colour may bleed. Spread into greased pan. Refrigerate for at least one hour. * Makes one 6 x 6” container, or double for an 8 x 8” pan. ** Notes: If the batter comes out too runny, stir in about 1 tsp or sugar or cake mix at a time until stiff. If too thick to stir in all components, slowly add 1/2 tsp of milk at a time, but batter should be thick! Like cake batter? 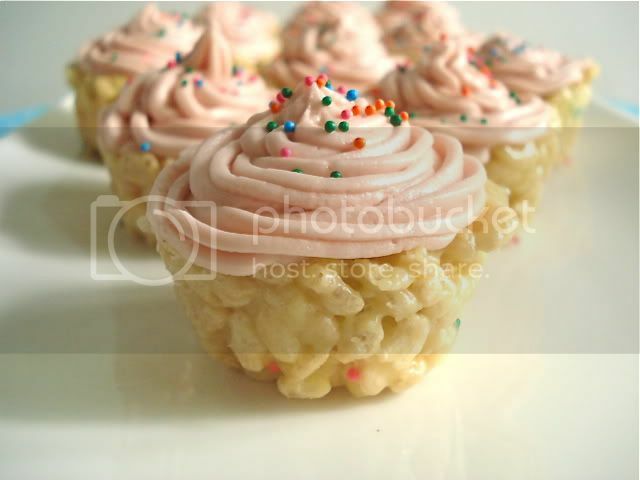 Then you will love these Cake Batter Rice Krispie Cupcakes. Yes. They are all of those things at once. Seriously. Do you think you could do this wit ha plain chocolate cake mix? Thanks, Andrea! Let me know how it goes! This stuff is soooo good! My 4 year old daughter helped me make it and then we had to fight over who got to lick the bowl ;). Thanks for such an easy recipe! Yum! I want to make this tonight! Enjoy! It's so easy and so good! have you tried it with different batter flavor? it looks so good i can't wait to try it. I haven't yet, but I really want to! If you try something good, please let me know! i used funfetti & it turned out amazing! I will be trying this with chocolate cake mix today!!! How did it turn out with Chocolate? I used German chocolate... turned out amazing!!! YUM! I can't wait to try it! I am waiting on my batch made with Pink Lemon aid! I'll let you know how it goes! So yep... it's amazing.. just as I expected :) Thanks!! Pink Lemonaid?? How much did you use? Sounds Yummy! Can't wait to try this for our girl scout bake sale! Will be using gluten/nut free cake mix, fingers crossed! I was wondering if this would work with gluten free. Sounds delicious. Have you tried it with a Gluten-free cake mix? I haven't tried it, but I imagine that it would work just fine - you might have to play with the amounts of mix, but give it a shot! Let me know how it goes! If you don't want to use a microwave, about how long should you cook over the stove? Just to boil? I've not tried it over the stove, but I would probably bring the milk and butter to just boiling, then pour into a bowl with the dry ingredients. Let me know if you try it! I made the recipe and although it tastes like heaven, it didn't set up and its just sticky goo....HELP!!! What can I do next time to make it set up all the way??? So sad! This happened to me once, and it was rather tragic. The solution is, while the fudge mix is still warm, alternate adding 1 tbs at a time of confectioners' sugar and cake mix. Do this until the mixture is quite thick and difficult to stir. It won't thicken in the refrigerator, it will only solidify, so make sure that the thickness is satisfactory before you press it into your pan! Good luck - hope this helps!! I have made this three times already since discovering the recipe last week. :o) The first time I used chocolate with toffee bits stirred in, the second was chocolate with peanut butter chips, and this last batch I tried using strawberry cake mix. Something went wrong with the strawberry one because it's not setting up like the chocolate ones did (it's still very "gooey"). Not sure if it was the mix or something I did. It's still good and I'll keep experimenting with it until I get it right. My kids and husband say thank you for the recipe too! Chocolate + toffee? YUM! I'm so glad you've tried out your own versions - they sound great! So sad that the strawberry mix didn't work - I would try alternating adding extra cake mix with extra confectioners' sugar until you reach that perfect thick consistency that I'm sure you know well, now ;) You can do this after you've stirred it all together and it doesn't look quite right. As long as the mix is still warm, you should be able to add more dry ingredients until it thickens up. Good luck! Hope this helps! I see the substitution option for soymilk, would almond milk work as well? I would bet that any milk substitution would work, but you might have to play with the amounts. I would start with less and then add more once it's been microwaved and stirred. If it's too dry to combine, add more! Good luck! Otherwise, these turned out fabulous!! Thanks for sharing! I have this sitting in the fridge for as a surprise for my hubby when he gets home... question though... Mine came out thick like play-doh & just about hte same consistency. Im sure it'll be fine, but is that what I should expect? What a great surprise! And yes, thick, play-dough-like consistency is what you're sort of going for. Hope it was delicious! HAHA! It would help to actually read the instructions- I used the whole package of cake mix- ya... I was wondering why it was so thick. But I still can taste what it's suppose to be, and heck- it still sticks, so sugar's sugar, right?!!! Can't wait to try it with the right measurements! I made the same mistake!!! I wonder how many others have done this as well LOL!! Glad to see I wan't the only one either. I used the entire cake mix too. Haha! No worries, we will still eat it! Devil's food required a good bit more dry ingredients but is beyond amazing. :) cream cheese icing on the side for dipping! Yum! Thanks for the tip! And fudge with dip? Wow. Yum. Do you think it work if you used just 2 cups of cake mix and no confectioners sugar? It might have some issues with consistency and would probably not be quite as sweet, but it might work! I would say that since it only takes 2 minutes, experiment! Start with 1.5 cups and keep adding cake mix after microwaving until you reach the consistency you want. How great would it be if it worked? 3 ingredient fudge? Amazing. I'm obsessed with your blog! I don't bake but feel confident that I could try any of these recipes and they would be a hit! Your pictures are amazing too. I wish there was scent-vision and taste-vision on the web :0 Keep up the great work!!! Thank you so much, Renee! Trust me, there's a reason I bake from a box ;) If I can do it, so can you! Uh, YUM! I found you via Pinterest and I knew I just had to make these tonight. I used a box of fudge marble cake mix and adjusted the recipe to use the whole box...wow! They are amazing! My husband works third shift so he won't be home until the morning and my kids are asleep; it's going to take every ounce of self restraint that I have to not eat the whole 13x9 pan of this stuff before he comes home/they wake up. For real. mine is chilling in the fridge! Made these today with a gluten free cake mix and they are sooo yummy! thank you for sharing them! I'm so glad they were good gluten free! What an awesome treat! I'm taking this recipe and ingredients with me on vacation tomorrow. Easy dessert to make on a house boat!! Can't wait!!! You had me at "no bakeing". Im gonna make some soon! IF I blog it, Ill link back to your blog. New follower too! I just made with with the Duncan Hinds Apple Caramel Decadence cake. I had to use a lot more cake mix to get it thick enough then I put the caramel on top. Its in the fridge right now. I can not wait to try it. Me & my girls made this tonight!! DELICIOUS!!! THEY R FIGHTING OVER THE BOWL!!!!! Amazing! I needed to add a bit more mix and sugar in mine but it came out great. i wish i had read the tips before i started. but not to fret, i will try again! Hahaha, it's ok. Kitchen mistakes are usually just steps towards kitchen discoveries :) Good luck next time! Chocolate chip cookie dough fudge??? Yes please!! Ummm, yes! Take the nap while it sets up in the fridge and you wake up to fudge. Best. Dreams. Ever. I made this today for the guys who are helping my husband and I remodel our basement and it was a huge hit! Not bad for cheap AND easy! =) Thanks for sharing. Could I do this with chocolate cake mix? Oh yum! What a good idea for failed attempts! And there you have it- all kitchen disasters have happy endings. Made this not 5 minutes ago. Now for the torture of waiting for it to set. If it turns out as good as every one says, I'll be making more, different flavour combos, for a church sale next week! I can so do t his in my college dorm! Thanks! Has anyone tried reheating the batter, then adding more mix after a mess up? Or would that not work >.< haha! Guess that's why they tell you to read through the entire recipe first!!! We tried it and had to tweak it a little. About a cup and a half of each instead of a cup because it was too moist. That being said it was delicious and we even made a chocolate version (same recipe, with the 1.5 cups each) with a chocolate cake mix and added some chocolate chips to the top. killer. Honestly- I could hardly tell the difference between my batch of dairy and my batch of dairy-free. Both were delicious and worked well. Do what works for you! I made it with a white funfetti cake but thought id mention that the store has a funfettii halloween cans mix from pilsbury so I think ill try that next with orange sprinkles!! I only have chocolate milk in the fridge.....but i'm gonna give it a whirl- how bad can it be!?! After trying the yellow cake version and loving it, I made a batch with devils food cake mix. Sooo good! Sadly i used the whole box instead of just a cup lol but next time i will do it right! does anyone have the modifications to share for using the whole box of cake mix? I'm short on time to experiment. Thanks. I tried this tonight and was so excited, but my mix was not "wet" like yours was in the picture...it turned into, basically, a dough...do you know what I did wrong or what I can do differently? Delicious! I made some this morning before heading to my parents' for breakfast so it would be all nice and set for an early afternoon shot of sugar. May have to try a chocolate version...what a great idea! red velvet in the fridge! i think i missed the part about how thick the batter had to be...but if it doesn't harden after an hour, i really wont be that disappointed, i'll just eat it the way it is. lol. could you use reg sugar? just made it with red velvet and chocolate sprinkles... YUM!! I made this with chocolate cake mix and wow! I had to add some more dry ingredients for the right consistency but I can't wait to try another flavor! OMG THIS WAS AMAZING! I went to go make it but realized I didn't have any cake mix. What I did have though was leftover brownie mix from making brownie pancakes (those are really good too btw). I just used the brownie mix instead and it was perfect! I did have to add a lot more sugar and mix but it was still good! I ended up making them fudge balls and rolling them in powdered sugar. So yummy! Thanks so much! If you double (or triple!) the recipe how long do you adjust the time in the microwave? I doubled the recipe, as stated, for an 8x8 pan. I think there was definitely too much butter. I ended up using almost the entire box of yellow cake mix and it was still pretty runny and extremely yellow (compared to the example pictures). It's in the fridge now so I will see how it turns out in a couple hours, but I think I may have to throw an egg in there and just bake it. We shall see! GENIUS. Just FYI, the mix 'n' pour bowls from Pampered Chef (and all the knock-offs, like I have, lol) work FANTASTIC for this (can we say easy pour?!). I'd just mention that if you do double it, I'd recommend a 9x13 for thinner fudge. The thick gooey-ness of this fudge is awesome in the 8x8, but for a crowd who may have other goodies on their plate, a thinner one is preferred. This was SO GOOD - as I licked the spoon clean I had to immediately put the fudge into the fridge otherwise I knew I'd just eat it all from the baking dish... oy. Thanks for sharing!!! i've had this recipe on my pinterest boards for awhile and finally got around to making it! like other people have said its super yummy! :) I don't have a microwave (i know! talk to the husband...) however, i just thought i would let you know how it turned out. i melted the butter and milk on the stove until just boiling and then poured in the cake mix and powdered sugar mixture. i did have to add a bit extra cake mix. [i used homemade cake mix and don't know if that was the difference or not? because of this i also added a small splash of vanilla. :)] also, i ran out of powdered sugar so just subbed regular sugar for the last little bit and it turned out just fine although maybe a little grainy so i wouldn't recommend using all regular sugar. Thanks for the recipe. I know i made a few changes, but it was a great place to start. Say, has anyone tried this with a different mix? I'm thinking the possibilities are endless! I'm having the same problems as some others with the consistency. I found that i had to double the cake mix/sugar amounts to get the correct "play-doh" consistency. The recipe prepared as stated turned out very runny. I recommend either doing as I did and doubling the dry ingredients or cutting the butter/milk amounts in half when making. The recipe was delicious and I will DEFINITELY be making again!!! I can't wait to try different combinations!!! Does this have to stay in the fridge? Since this recipe includes butter/margarine and milk/substitute that would otherwise require refrigeration, I would say yes. It also helps keep the texture firm. I also find that it tastes best when cool! Enjoy! This is a bit saddening to read. I was hoping to send them with my Husband for work before Christmas, but they don't have a refrigerator and I wouldn't want the fudge to be too soft by the time his coworkers are able to get to it. May try it for Christmas at the folks house though. This was so good! It was so easy...the most difficult part was waiting for it to chill in the refrigerator. Thanks for sharing! I found this on pinterest, and love it. I have always been a baker so when my oven went out I was devastated. I have looked for no bake deserts and have only found a few that I really like. I started to follow your blog when I saw multiple no bake recipes, and have found many that are lined up for when my oven is fixed as well! I have to work twice as hard at the gym but it is soooo worth it. thanks for this and all your great looking recipes! can't wait for a new oven! So this was really good! One huge thing I want to mention since some people are saying theirs is too wet-- this worked for me when I did a single batch but not a double. When I tried the double batch, it was runny and needed more dry ingredients and more microwaving. The single batch was fine as written. Anyone try this with Splenda? I am trying this with a pineapple and strawberry cake mix and layering it. Will see how it turns out. I definitely had to add almost another 1/4 cup of milk to mine - I also used a white cake mix instead of a yellow one...I don't think, however, that the type of cake mix used would affect the outcome that significantly! Any thoughts?? I don't mind the addition, but was just curious! By the way - I could hardly put the bowl down after getting everything mixed together before putting it in the fridge - I might just "forget" these at home this afternoon when I leave for work!!!!!! um mine has an odd aftertaste. is that supposed to be there? mine never has, we lightly grease the pan with Pam Baking Spray. the first time we used very little oil and you could taste heavily on the fudge. The baking spray has a sweet taste and made a huge difference. Hope that helps! Just tried this... Waiting for it to chill... My 1100 watt small micro made it too hot at only 1:30 min and melted my sprinkles when I added them before mixing! Oh yeah... As a note... I substituted Confectioners Sugar, with 3/4 Cup Splenda and 2 Table Spoons of Corn Starch blended to a fine powder to make a sugar-free confectioners sugar substitute! I love this recipe! My 5 year old daughter and I have made quite a few different combinations. We do 1.5 cups of the dry ingredients, keep the liquids the same and double the recipe for a bigger pan. So yummy! We'll be making strawberry mix with toffee chunks, chocolate with m&ms, and funfetti with bunny sprinkles! I made this yesterday and doubled the recipe. 2 cups each of yellow cake mix and powdered sugar and 1/2 cup each of the milk and butter. It seemed really thick, but it didn't set right and was just thick, sticky goo. It still tastes great though. lol How do I know that I need to add more cake mix and powdered sugar? It seemed thick enough that it was going to set. Can't wait to go shopping for cake mixes and try this. From my experience, any time I've attempted fudge, or any candy which needs to "set up", it fails to set up properly for me if I make it on a cloudy day. Too many failed attempts over the years have taught me to only make fudge on a clear and sunny day. Possibly this was the problem for those whose batches failed to get firm? This was Amazing. Didn't have yellow cake mix so I used white. It was still awesome! I just made this....with vanilla cake mix. it is amazing. I cant wait to try it with lemon!